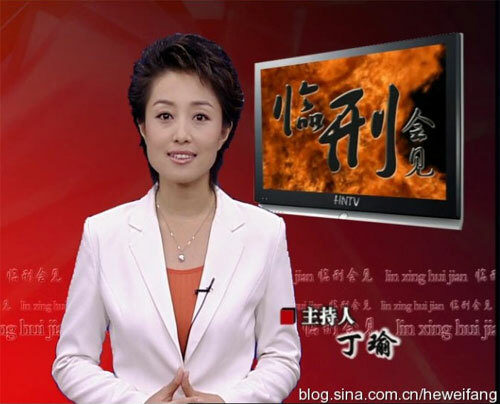 “Dead Men Talking” had been running on a Henan TV Channel, unnoticed by the wider world, for a number of years; building up a domestic audience of more than 40 million regular viewers and turning the glamorous Miss Ding into something of a star in her field. During this time Ding Yu interviewed more than 220 death row prisoners. Due to restricted family visits for death row prisoners, the inmates often agreed to do an in-depth interview with Miss Ding in order to have the opportunity to send a final farewell message to their relatives. 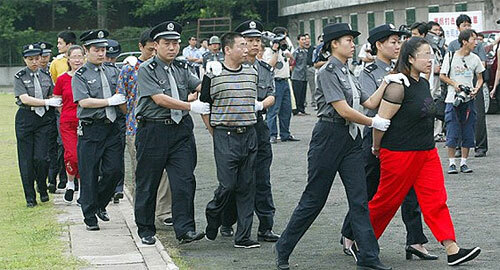 Nearly all the prisoners interviewed had been condemned to death for violent crimes rather than for corruption, or other white collar crimes that also carry the death sentence in China. The interviews tended to follow a similar pattern. The first questions were typical warm up questions about likes and dislikes, before moving on to questions of motive and repentance. Sometimes, if the prisoner was unrepentant, the gentle and prim looking Miss Ding suddenly turned into a vengeful ogre and would begin insulting and demonizing the interviewee. One interesting anecdote from one of her interviews: Ding Yu had become so accustomed to interviewing violent criminals that when a homosexual prisoner / interviewee, sentenced to death for brutally murdering his mother, asked her if she felt uncomfortable being near him, she replied that, effectively, she was uncomfortable, because she had never met a homosexual before… Interestingly, the prisoner’s homosexuality bothered her far more than the fact that he was a cold blooded matricide!